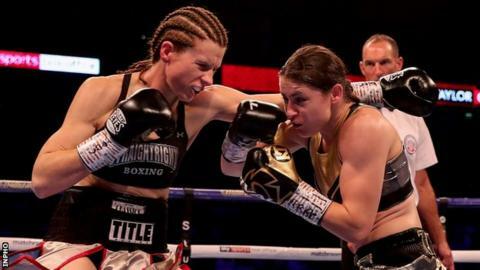 Ireland's Katie Taylor retained her WBA and IBF lightweight world titles with a third-round stoppage win over USA's Kimberly Connor at London's O2. After bossing the opening two rounds, Taylor, 32, produced a barrage of blows on the 37-year-old in the third to earn her 10th professional win. A swelling appeared under Taylor's right eye in the second round and she quickly moved to end the contest. "I knew I had a bump around my eye," said the London 2012 Olympic champion. "It was good, Kimberly was very tough. I just happened to catch her with a good shot, stay composed and finished it. "It has always been the plan [to be undisputed champion]. I have two belts and I have two more to go." Taylor, who beat Argentina's Victoria Noelia Bustos in April to add the IBF title to the WBA belt, will make her next title defence in Chicago on 6 October when she faces experienced Puerto Rico-born Cindy Serrano. The Irishwoman, in her first fight since her estranged father and former trainer Pete Taylor was injured in a shooting at his gym in Bray, set the tone for Saturday's contest by producing two sharp punches in the opening 20 seconds. Taylor continued to land with regularity in round two although the swelling under her eye was noticeable as she went back to her corner. Taking no chances, the Bray fighter produced a flurry of blows to wobble Connor early in the third and after the stunned American dropped her guard, referee Steve Gray jumped in to end the contest. Taylor's beaming promoter Eddie Hearn lauded the fighter after her impressive performance. "Forget men's boxing, forget women's boxing, she is just one of the stars of the sport," said Hearn.